The Camp Nou and the Ciutat Esportiva were the venues for a day of activities that FC Barcelona hosted in honour of the Club’s sponsors this Thursday. 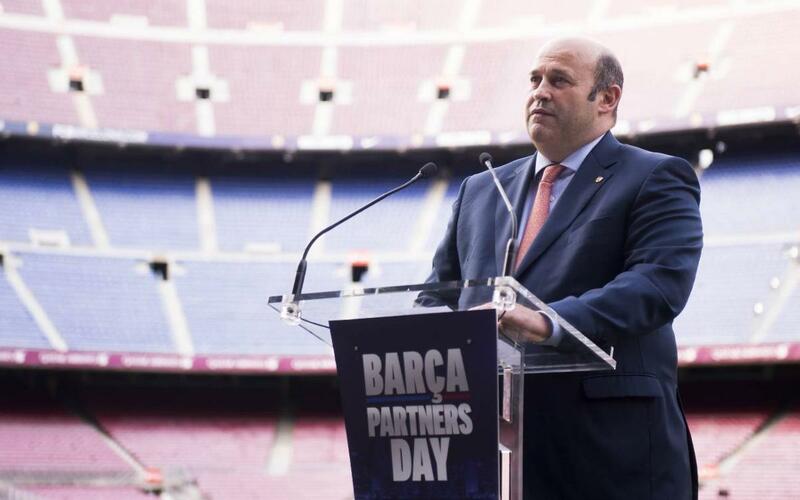 A match on the Camp Nou pitch, a lunch at the Masia, and a series of conferences headed by the Club’s CEO Òscar Grau were the main events. Proceedings started on Wednesday evening with a conference and welcome cocktails hosted by Francesco Calvo, FC Barcelona’s Chief Revenue Officer, and Guillem Graell, Director of the Club’s Brand. On Thursday, the action started in the Camp Nou changing rooms where all the participants put their kit on. Once they were on the pitch, a Barça Legends video was projected before they warmed up and started the match. Smiles, effort and sportsmanship were on display throughout and the medal ceremony brought this part of the day to a close. The Masia in the Ciutat Esportiva Joan Gamper was the second destination of the day as the participants enjoyed a jovial and relaxed lunch. Then it was time for a series of conferences on five different topics: Espai Barça, Barça Innovation Hub, Rakuten Welcome, Digital Strategy and Barça Legends. Òscar Grau, the Club’s CEO, welcomed each speaker onto the stage. These included Bill Manarelli, Director of Espai Barça; Javier Sobrino, Director of Strategic Planning and Knowledge; Rahul Kadavakolu, Rakuten Inc.’s Executive Director of Global Marketing and Brand; Russell Stopford, the Club’s Digital Director, and Joan Carles Raventós, Director of Commercial Projects. The Barça Partners’ Day ended with a dinner at the Camp Nou provided by 2015’s best restaurant in the world, Celler de Can Roca.